I love love love rice cake, we call it Lontong in Indonesia, especially the plain one. It makes eating rice much more fun! LOL.. I believe rice eater out there get what I mean. Rice is very versatile. It goes almost with anything. From side dish to main dish to dessert. YAY for rice!!! One thing tho in making Lontong, it takes too long time and a bit complicated. My mom makes it with banana leaves. It is super super good, I love how the banana leafs scents on the rice. The downside is; making it takes courage, efforts and patients... which I don`t posses, obviously!! (look how I steal the pic above).. I mean, come on, where do you get the leaves anyway, and where do you find the time to wrap it. My greatest appreciations goes to you out there that make this kind of lontong!! Some other cooking folks make it by boiling cooked rice wrapped in alumunium foil for an hour or so. I used to do this but not anymore since it consumes a lot of time, electricity, and patients. Geez, if you count all of that, it makes lontong such a luxury food, isnt? At least it is for me. I used to make lontong for special occasions. Another pic stolen from a neighbouring blog. I deserve a spank! Then until one snowy evening, I craved for a lontong but I really don`t feel like to spill much effort into it. So this what I did; I cook the rice as I usually cook and I just added half of the water. Just to make it more sticky but not porrigdey. 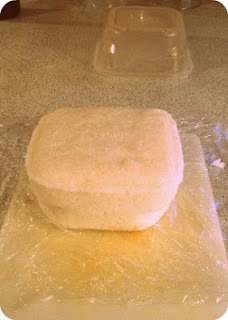 Once its cooked, I packed it tight into a square lunchbox, like Tupperware, but in my case, I used Ziplock square. I based the box with plastic foil tho so the rice won`t stick and easier to take out. Make sure to put as much as rice in the box so it become very packed (press it with spatula if you need), then wrap the top with the plastic foil before you close the lid. After that I let it cool. Put it in the fridge for a faster cooling time. I wasn`t sure if it will work. So I didnt hope much out of it. but, look how it turned out!! This one is my original pic. Its purrfect!! The texture is just perfect. When I packed it into the lunchbox, the rice was a bit sticky but after it cooled down, it comes out with a perfect texture. Easy to cut, the rice didnt fall apart. I used cal-rose rice, medium grain, the fat roundish rice, not the lean long grain rice like basmati. It WILL NOT work with basmati rice. but please feel free to prove that I am wrong! So, what is the importance of cake rice in my life that it made me feel very much victorious over the success of the square lontong and that I had to share it with you? because in my beloved Indonesian Cuisine, we have particular food that goes better with lontong then normal rice. Other reason is I found it much more presentable when you are inviting guests. Sometime food appearance does count!